Trio of Bacardi Rum Glasses=Different Designs=Two Clear=One Green. Pack Of 6 New Boxed Havana Club Glasses. Condition is New. Dispatched with Royal Mail 1st Class. Glencairn SKYE Skyline Isle of Islay Whisky Spirit. This glass is brought to the market by Glencairn the leading authority. Wrap around Skyline Isle of Islay design on these beautiful. An ideal present or gift for the discerning Malt Whisky or Spirit Lover. Drinkin' Rum Before. IT IS YOURRESPONSIBILITY TO MAKE SURE WE RECEIVE YOUR ENGRAVING DETAILS CORRECTLY AS ANY MISTAKES CANNOT BE RECTIFIED ONCE THE PRODUCT HAS BEEN ENGRAVED. 10am Makes You A.
Havana Club tall slim glass with logo. The tall Havana Club Glass is the perfect size for serving up a classic cocktail, such as a Mojito or Cuba Libre with the popular Cuban rum. This stunning glass would enhance any bar, collection or make a super gift. Will dispatch immediately and contents will be secured safely. This glass is brought to the market by Glencairn the leading authority. An ideal present or gift for the discerning Malt Whisky or Spirit Lover. glass known throughout the Whisky World as the Industry Leader. Glencairn SKYE Scotland Whisky Glass. This glass is brought to the market by Glencairn the leading authority. An ideal present or gift for the discerning Malt Whisky or Spirit Lover. Scotland connected to the Whisky Industry and Distilleries. New malibu pineapple glass plastic. 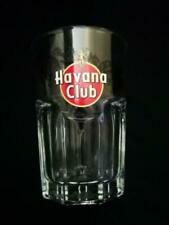 A brand new Havana Club rum glass. The Havana Club cocktail glass. Rum cocktail glass for Cuba Libre or Mojito Large balloon glass for all Havana Club Coctails. This stunning glass would enhance any bar, collection or make a super gift. Will dispatch immediately and contents will be secured safely. Glencairn SKYE Skyline Edinburgh Whisky Spirit. This glass is brought to the market by Glencairn the leading authority. An ideal present or gift for the discerning Malt Whisky or Spirit Lover. glass known throughout the Whisky World as the Industry Leader. Glencairn SKYE Skyline The Whisky Trail Whisky Spirit. This glass is brought to the market by Glencairn the leading authority. Wrap around Skyline The Whisky Trail design on these beautiful. An ideal present or gift for the discerning Malt Whisky or Spirit Lover. MALIBU Rum Tumbler Glass. All of these glasses have either scratches or bubbles in the glass. They are not perfect, hence the low price. Grab yourself a bargain. CLEARANCE SALE . The perfect addition to your glass collection or a fantastic unique gift! 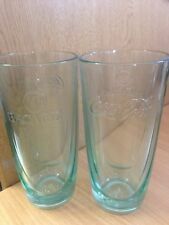 2 x Havana Club tall glasses with logo. These Havana Club Glasses are the perfect size for serving up a classic cocktail, such as a Mojito or Cuba Libre with the popular Cuban rum. Standing 13.2cm with a 6.2cm diameter and weighing 0.229kg. These stunning glasses would enhance any bar, collection or make a super gift. Will dispatch immediately and contents will be secured safely. 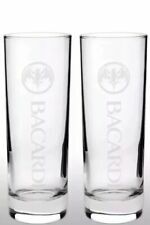 4 X Bacardi Tall Glass hi ball approx 5.5"
Size - 22cl / 220ml. Quantity - 2 Glasses. Size - 22cl / 220ml. Quantity - 1 Glass. DOUBLE RUM. SINGLE RUM. IT IS YOURRESPONSIBILITY TO MAKE SURE WE RECEIVE YOUR ENGRAVING DETAILS CORRECTLY AS ANY MISTAKES CANNOT BE RECTIFIED ONCE THE PRODUCT HAS BEEN ENGRAVED. We don't send invoices out with orders. These Havana Club Glasses are the perfect size for serving up a classic cocktail, such as a Mojito or Cuba Libre with the popular Cuban rum. These 35.5cl glasses offer a practical stacking design and are made from toughened glass, making them ideal for use in bars or at home. These stunning glasses would enhance any bar, collection or make a super gift. Will dispatch immediately and contents will be secured safely. 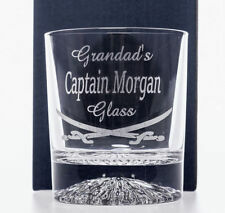 Personalised Large Whisky Glass Engraved Father Of The groom Wedding Gift Box. 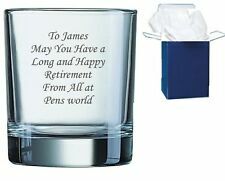 Text colour, no colour just engraved outline cut into glass. IT IS YOURRESPONSIBILITY TO MAKE SURE WE RECEIVE YOUR ENGRAVING DETAILS CORRECTLY AS ANY MISTAKES CANNOT BE RECTIFIED ONCE THE PRODUCT HAS BEEN ENGRAVED. We don't send invoices out with orders. The Hemmingway Special Daiquiri developed from Papa Hemmingway's request for a daiquiri without the sugar. After a couple of iterations - the recipe that we have here has taken shape. 50ml of Havana Club Cuban Barrel Proof. The curved profile of the glass flares out at the top to help release aromas within the lower bulb. The bottom of the glass has our ROCK which creates a natural liquid motion further increasing the nosing of aromas. A QUALITY KRAKEN SPICED BLACK RUM MASON JAR/ GLASS. HAS THE KRAKEN BLACK SPICED RUM LOGO. ON THE FRONT OF THE JAR. APPROX 13 CM TALL AND 7 CM ACROSS THE TOP. A QUALITY KRAKEN SPICED BLACK RUM MASON JAR/ GLASS. THE KRAKEN LOGO IS EMBOSSED ON BOTH SIDES OF THE GLASS.